The first thing I did was paint the frame and cut some MDF chalkboard to put in the frame. HERE is a tutorial on how I make my chalkboard frames. Next, I designed the chalkboard art. 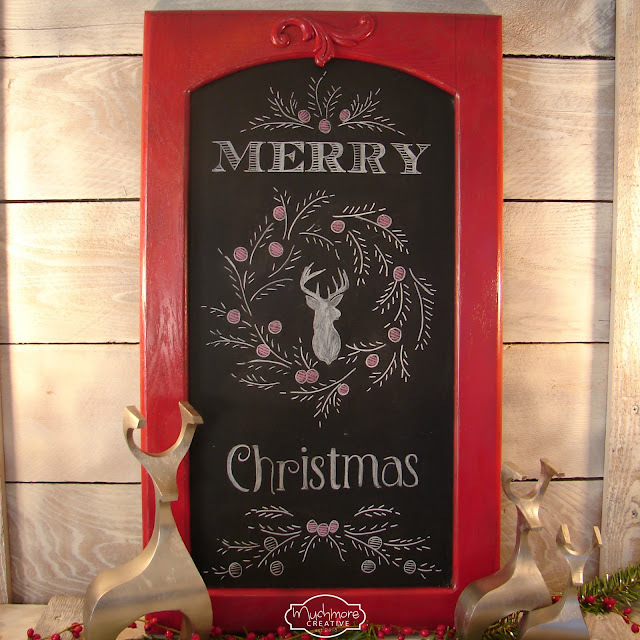 I have another tutorial on how I make my chalkboard art HERE if you are interested! Be sure to stop by these fun link up parties! Awesome! I love it & will definitely check out your tutorial! Beautiful work! Wow Brenda this is so pretty and you did a great job making it. This is perfect for Christmas! 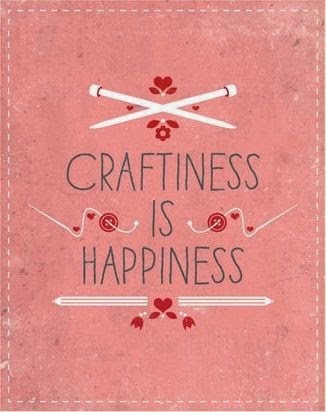 Thanks for sharing it with us at Cooking and Crafting with J & J. Love how it turned out! Looks great! Brenda, this is gorgeous! Visiting from Kleinworth & Co. - pinning! Have a happy week! I'm addicted to chalboard art! I love this one, Brenda, it's beautiful! I love the deer and letters you used! So pretty, Brenda! I love the Red frame and chalk! 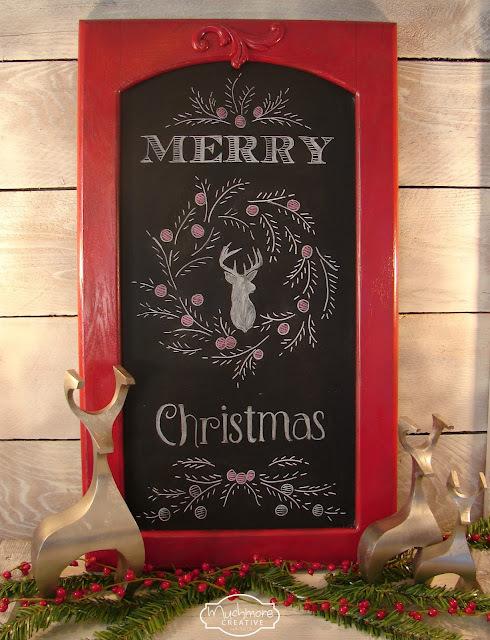 My dear Brenda, your Christmas chalkboard is perfect for the holidays. I just love the holly on it :) It's always a delight to have you at Roses of Inspiration. Hugs and blessings! I love it Brenda! 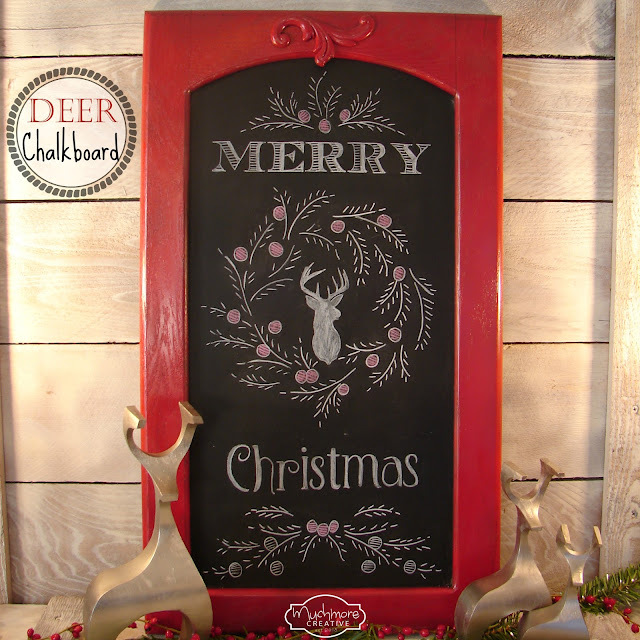 I am hoping to draw a stag on my chalkboard this year. Haven't had a chance to attempt it yet. Thanks for sharing with SYC. Wow, I love this!! I'm coming over as a co-host from the Wonderful Wednesday Link Party ( a little late) .Your gorgeous chalkboard will be a featured link at the party this week!! See your feature at Wonderful Wednesday, mustlovehome.com starting Tuesday at 6PM EST. Thanks so much for sharing with us! Thank you so much for linking up to You're Gonna Love it. You were the most clicked link this week and I"m so excited to feature you! Love this! iT's a fave this week on Wake Up Wednesday! Thanks for sharing! Wow, Brenda great job. You did a fantastic job. Thanks for sharing with us at Wake Up Wednesday Linky Party. Check out your Featured Post at tomorrow evenings party. This is beautiful, love all the little details in your design and the red frame compliments it perfectly. Oh just gorgeous! Featuring when my link party opens up tonight! I'm your newest follower, number 35. Love your chalkboard creations. Will be back to see your previous posts. Found you thru Mrs. Olson's Share Your Cup. Love it!! From the frame to the images you used!! Pinning!